It should already be clear that there are a wide variety of behaviours and responses on show during training and matches, and not all of them are desirable. One of the main aims of this book is to help you as the coach identify these behaviours and recognise their potential impact upon performance. Then, through conscious effort and a targeted approach, you will be in a better position to have a more positive and consistent impact on your player’s psychological skills. 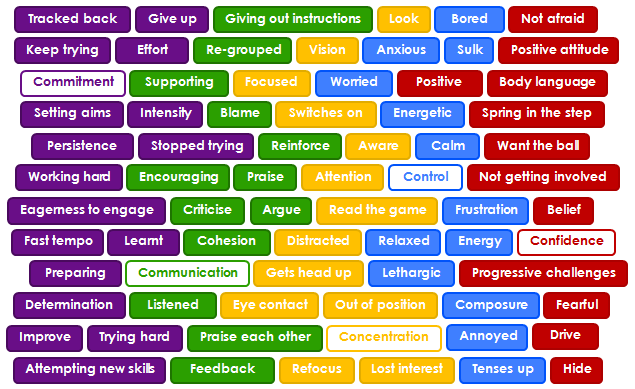 Take a moment to look back again at the colour coded list of behaviours shown by the player during training and matches. 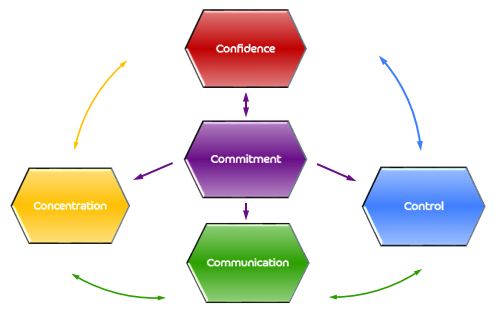 Invariably, these behaviours and responses bear close similarities to each other and can be grouped based upon their relation to a player’s level of commitment, their communication skills, their ability to concentrate, their self-control, and their overall confidence, as shown below. Collectively these are known as the 5Cs and represent what we consider to be the important components of positive psycho-social development in players. When one considers a player who is thriving in the game, then this is most probably a player who is highly motivated, able to regulate their emotions and their attention appropriately, and a player who has good interpersonal skills. These characteristics may indeed underpin mentally tough and emotionally intelligent players who both challenge themselves whilst maintaining effective relationships with others. We believe that the 5Cs should form the spine of psychological and social skill development for every competitive youth soccer player. 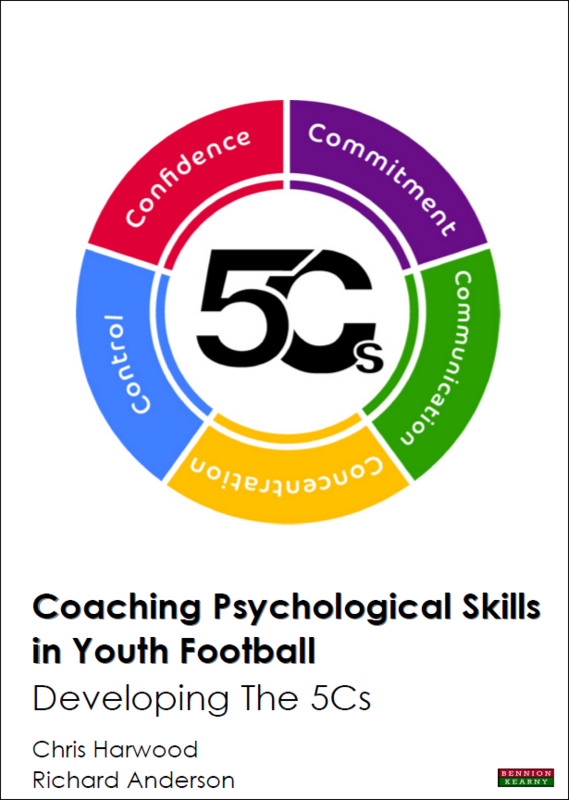 Therefore, the aim of the 5Cs program in this book is to increase the awareness and confidence of coaches with respect to their ability to coach these psycho-social skills so that young players benefit from their development. At the core of the 5Cs is a player’s commitment. This motivational quality drives the player within their training and matches. It is characterised by players who show consistent effort, high quality preparation, and a desire for learning; players who focus on making improvements and progressing from their mistakes. Having high levels of commitment holds the 5Cs together, because without the appropriate quality of motivation, the other Cs will not function effectively. Building on the foundation of commitment is communication. Communication represents a player’s ability to relate to others (e.g., teammates, coaches, parents) through how they send and receive information to and from each other. It is an interpersonal quality that is characterised by players who share information, ask helpful questions, listen respectfully, and accept feedback. Players with good communication skills strive to be highly coachable as well as being able to communicate non-verbally, alongside encouraging and instructing their teammates clearly and confidently. The next critical C is concentration. This is essentially a player’s ability to focus on the right thing, at the right time. 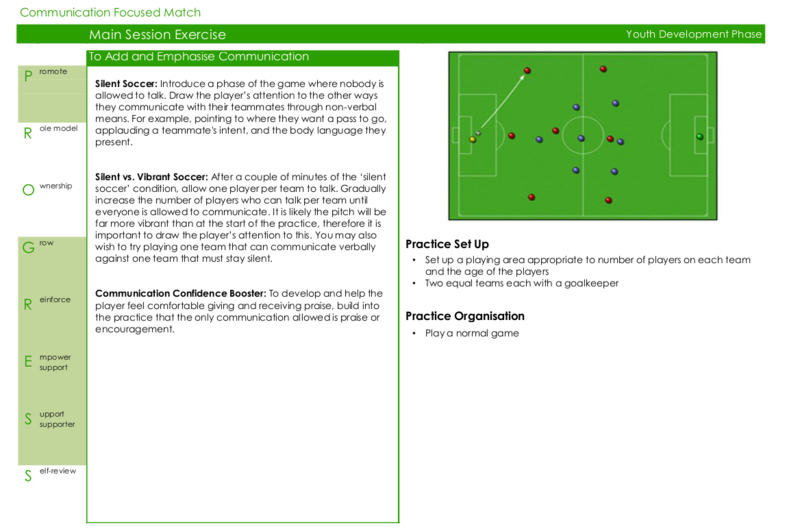 It is characterised by players who focus on a task through to a conclusion and stay focused on key components of a task in the midst of many potential distractions that compete for the player’s attention. Concentration is strongly linked to a player’s control skills which also rely heavily on the quality of a player’s commitment and communication abilities. Control is characterised by a player’s ability to regulate their thoughts, feelings and emotions in order to manage their behaviour and performance. Players with expert control know how to apply, direct, and ration their available mental and emotional energy in response to a specific situation, event, or task on and off the pitch. Such players remain composed yet alert, implement breathing and other relaxation techniques, and display positive, helpful reactions to themselves and others following mistakes, poor officiating decisions and other game events. The final C, confidence, is the outcome of well-developed commitment, communication, concentration and control. It is the belief that a player has in executing a skill to a desired level or achieving a specific outcome. It is characterised by players who try new skills, take calculated risks, show strong body language, and stay involved in the game. Such players consistently ‘play brave’ and want the ball regardless of the scoreline or time left in the match. The model below outlines these interactions between each of the Cs, and acts as a starting point in aiding your understanding of the 5Cs. The 5Cs are psychological and social qualities that help young athletes to ‘play brave’ in training and competition. Football coaches pride themselves on their technical and tactical knowledge, and applying this knowledge to help young players is a tremendously motivating and rewarding experience. Likewise, influencing and shaping a player’s psychological and social qualities is a significant and valuable undertaking for a coach. It is a mission in which coaches play a vital developmental role. 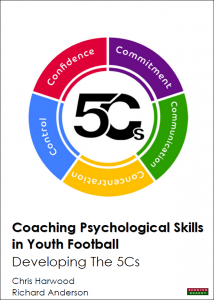 Therefore, the 5Cs program is designed to weave these psychological skills into the fabric of your normal technical and tactical coaching practice, at developmental stages when your players are most open to psychological skills training. A chapter will be devoted to each ‘C’ within which we first introduce the ‘C’ and outline specific behaviours associated with it. We then educate coaches further with what we feel is fundamental knowledge for the coach to possess, before presenting strategies and practices that can be integrated into typical coaching session plans. We subsequently offer examples of how the ‘C’ can be integrated into the yearly coaching curriculum, and also how coaches can self-review and reflect on their implementation of the ‘C’ in their coaching practice. The heart of the book covers all of the 5C’s sequentially in this manner. Beyond focusing on the actual 5C’s themselves, we have also developed a set of principles that coaches can follow when integrating each ‘C’ into their coaching. Derived from education, research and personal experience, we believe these are useful guidelines in helping players to understand the 5C’s and to normalise mental skills as something that are totally fundamental to their development; not something that should be viewed with fear or scepticism. The next chapter (Chapter 2) discusses these principles under the acronym ‘PROGRESS’ so that coaches are ready for the subsequent chapters where each ‘C’ is introduced. You will notice some of the principles coming through in the practices of each ‘C’, and we therefore recommend that you read this chapter first before reading about each ‘C’ in depth. Finally, we will complete the book with an example case study from a coach who has gone through the 5C journey upon which you are now embarking. 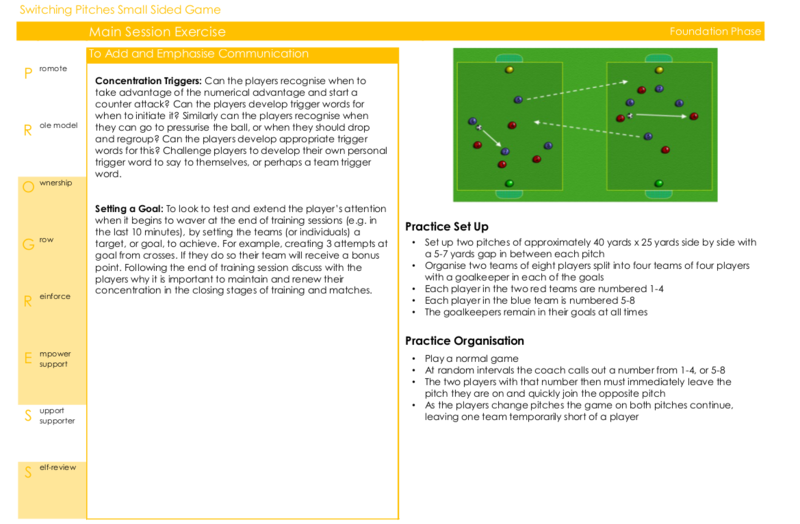 This real-life discussion focuses on how this coach used his increased awareness and knowledge around the key principles, skills and behaviours of the 5Cs and incorporated them into his normal coaching routine. We hope that the true-to-life coaching episodes presented in this section will consolidate the principles covered within the book. Moreover, we hope that it serves as an ongoing resource to refer back to in order to help you reflect on your own experiences in weaving each ‘C’ into your training programme. 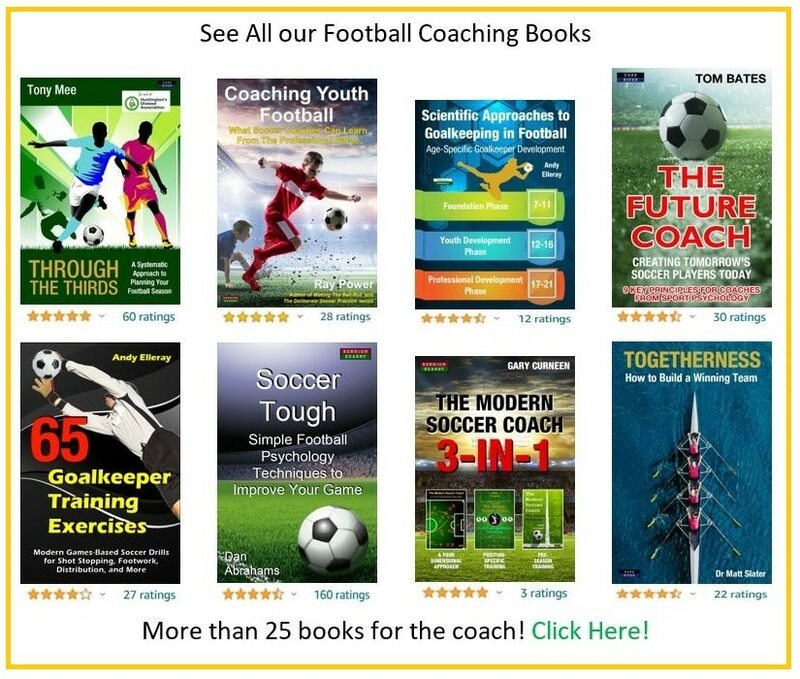 Whilst our advice for youth coaches is to work through each ‘C’ one by one and practice through trial and error, we do encourage you to read the whole book first. In this way, you will gain a clearer feel and understanding for the whole system and the holistic strength of the 5C’s as a total, integrated approach. From this foundation of knowledge, you can decide how you want to go about making advancements and changes in your coaching. We do encourage inexperienced coaches to focus on each single ‘C’ for a few weeks (e.g. 4-6 sessions) before moving on because it will lead to the development of a stronger repertoire of experience and practice for the following season when coaches can start integrating and reinforcing multiple ‘C’s at once in a given session. Most importantly, we hope that the book builds your confidence as a coach, and that you feel the benefits from a growing, practical knowledge of sport psychology in youth soccer.